Did you know that Hartley now has a barber? And what’s more, they are located on licensed premises, so you can have a beer while getting your haircut. 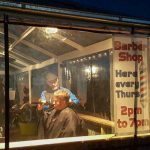 Every Thursday, from 2pm-7pm, Nick the mobile barber from Male Overhaul will be setting up shop at the Hartley Saddlery (next to Adam’s Shed). 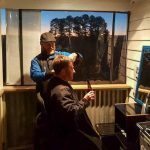 A veteran of over 20 years in the personal grooming business, he has worked in Sydney, Adelaide and on cruise ships and has been running pop-up barber shops in Katoomba and Blackheath since 2011. Nick does a great haircut, is a wonderful conversationalist and his prices are quite reasonable. He has a loyalty card and after 10 haircuts, your next one is free. And just when you thought it couldn’t get any better, Nick is also a qualified massage therapist and being a mobile service he can come to your home. What a great extra service to offer guests at your farm-stay or B&B. I had a haircut and beard trim while sipping on a Zig Zag Brewery Mountain Bitter and I rate the service 9/10. If I could only convince Johan to play something other than country music it would be 10/10!